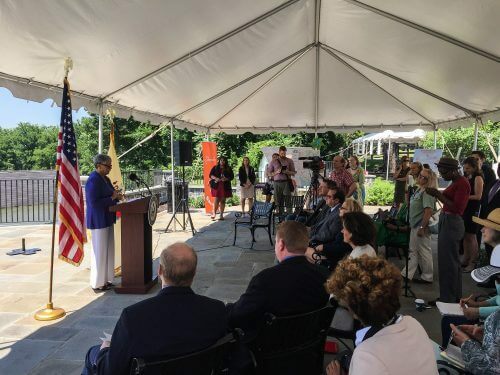 HOPEWELL TOWNSHIP, NJ (June 29, 2016) – Congresswoman Bonnie Watson Coleman (NJ D-12) announced today she will introduce legislation to toughen Federal Energy Regulatory Commission (FERC) oversight by requiring it to apply more comprehensive procedures to its review of proposed pipeline applications before granting a certificate of public convenience and necessity. “Proposals like that by PennEast have shed light on problems with the FERC regulatory process. FERC relies on antiquated laws and old energy realities to make present-day decisions. This prompted the New Jersey Assembly to pass the resolution I sponsored that urges Congress to revise laws and FERC rules that give more oversight to states to protect our natural resources and communities. I thank Congresswoman Watson Coleman for moving the issue forward at the federal level,” said Assemblywoman Elizabeth Maher Muoio, (D-15). a region’s ability to meet any energy deficiencies with economically viable and less environmentally disruptive alternatives to pipelines. Watson Coleman’s legislation will also require a fuller examination of cumulative regional impacts on the environment from pipelines, and a five-year monitoring program for approved interstate pipelines to ensure that identified environmental impacts are mitigated. Earlier this month, Watson Coleman also announced her support for a complaint and motion filed with FERC by the Eastern Environmental Law Center (EELC) requesting an evidentiary hearing to assess public need for the PennEast pipeline in light of the self-dealing relationship between the owners of the project and their affiliates that have contracts to receive gas from the pipeline. EELC filed this legal action on behalf of the New Jersey Conservation Foundation and Stony Brook-Millstone Watershed Association (SBMWA). The U.S. Senate heard testimony on June 14 by the Environmental Defense Fund (EDF) cautioning against overbuilding unnecessary pipelines and calling for FERC to take a closer look at market need. “Retail energy customers would benefit from policy refinements whereby FERC undertakes a more robust and detailed assessment of the extent and duration of market need for new interstate pipeline capacity by refining its longstanding pipeline permitting policy — which largely relies on the mere existence of transportation service contracts as sufficient evidence of market need,” testified N. Jonathan Peress, Director of Air Policy for EDF. Last month, a resolution sponsored by New Jersey Assembly Members Elizabeth Maher Muoio (D-15), Reed Gusciora (D-15) and Daniel Benson (D-14) was passed by the Assembly urging the president and Congress to change laws and FERC to revise the rules concerning interstate pipeline approvals in order to more fully assess need and address adverse impacts.